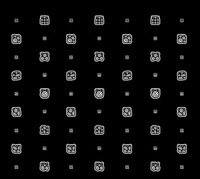 FabWall presents wallpaper which contains digital information, including images and texts, in forms of markers or patterns. This marker based AR view can be revealed by an application on the iPhone. 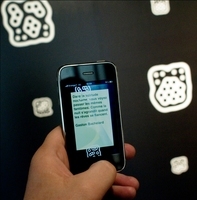 The motifs on the wallpaper are the markers that then allow for the AR technology to showcase the extra information. Through the iPhone’s camera and the marker based technology, completely new information and images become visible. SoGeo provides the OpenGL 3D technology necessary for allowing the phone’s camera to detect the markers in real time and let the augmented reality appear on the phone’s screen. Because the iPhone recognizes the markers in real-time, visitors walking along the wallpaper will experience changing AR based features. Images, twitter feeds, text and animation that are stored in markers on the wallpaper become alive on the screen of the phone. FabWall is a strategic reflection on the changes in design, manufacturing and distribution of wallpaper. Jean-Louis Frechin and Uros Petrevski of NoDesign.net have already received the main prize of the Musée des Arts Decoratifs for FabWall. NoDesign.net and SoGeo are currently also working on making wallpaper available to consumers. This will be released later this year by Lutece. 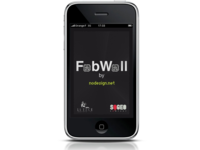 The iPhone application for the FabWall exhibition is currently available at the museum, for the duration of the exhibit. FabWall has been created by Jean-Louis Frechin and Uros Petrevski of NoDesign.net. FabWall is part of WallpaperLab, an exhibition including five different groups of artists presenting reflections on changes in design, manufacturing and distribution of wallpaper. The exhibition is showing at the Musée des Arts Decoratifs in Paris from 7 May – 15 August, 2010.